So for the month of June, the chosen bread was Maritozzi Con La Panna or Roman Cream Buns. Fancy name huh? Don’t you wanna repeat the name over and over? They are originally soft buns speckled with toasted pine nuts, enriched with the addition of Orange zest, peels & juice and they are split and served with whipped cream. Maritozzi are typically had for breakfast in and around Rome. Imagine having whipped cream for breakfast!?! I would love to move to Rome just for this I would never have this in the morning.. Mix the yeast, warm milk, 1 Tsp of the sugar and 1/2 Cup of the flour in a large bowl to create a smooth paste (The milk should be warm to touch- neither too hot- it might kill the yeast, nor lukewarm- the yeast might not get activated. So the temperature is very important). This is known as the starter. Set it aside for half an hour. Take this starter, 1 cup of flour, salt, the egg, remaining sugar, butter and vanilla extract in the bowl of your stand mixer or processor and knead until the dough is soft, smooth and not sticky. Add the remaining 1/4 cup of flour (or more liquid) ONLY if required to bring the dough to this consistency. You can also do this by hand. Knead for about 10 mins, you will feel the dough transform under your hands. Dust a large bowl with some flour and keep the dough in it. Loosely cover it and let it rise for 1 & 1/2 to 2 hours. When the time is up, the dough should have doubled in size. Take it out and lightly knead the dough. Divide it into 6-8 equal portions. (I got 7). I don’t know how else to explain the shaping, so I am quoting from Aparna’s recipe here: Roll each into a smooth ball and then flatten it out into a circle with your fingers. Roll up the circle, jelly/ Swiss roll style and seal the seam. 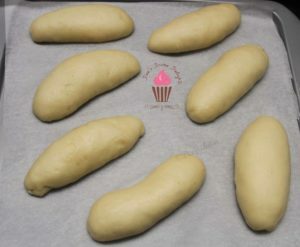 Shape into an oval ad pace on a lined baking sheet leaving enough space between the rolls for them to expand when they rise. Again, loosely cover them and set aside for 1/2 an hour for the 2nd rise. 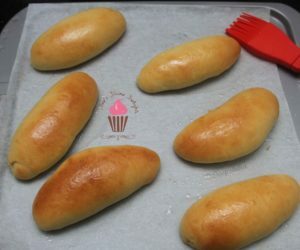 I gave the rolls a milk wash before popping them into the oven- just to get a nice color, though the recipe doesn’t require it to be done. 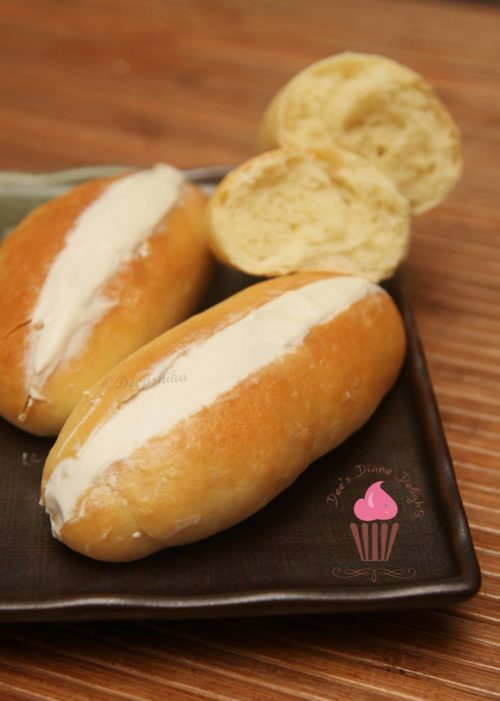 Preheat your oven to 180*C and bake the buns for 15-20 mins or until the buns are golden brown on top and bottom. While they are baking, make the sugar syrup by bringing the sugar & water to a boil in a saucepan, until the sugar dissolves. Once the buns are out of the oven, immediately brush the syrup on top of each bun. Let it cool completely. 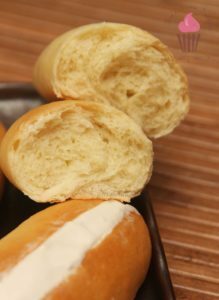 When you serve, take a knife and slit the buns right at the centre but not all the way thorough and fill them up with some delicious whipped cream. Alternately, sprinkle some icing sugar on top of the buns and have them plain. I am drooling here! Bookmarking this Deep! Tx for sharing!